The luxury sedan receives a craftsman's touch inside and out. We are in the midst of motor show season, with South Korea the latest country to host its very own automotive extravaganza at the Seoul Motor Show. 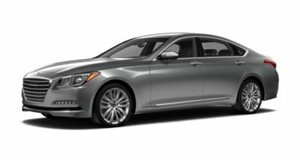 Hometown favorites Hyundai is bringing out the big guns to impress the locals, and today it was the turn of the Genesis G90 Special Edition to hog the limelight in the Korean capital. Inspired by a pin-stripe suit, the special edition model is distinguished by a trio of unique two-tone paint schemes. The colors are elegantly separated by a hand-painted feature line running the length of the luxury sedan applied by a craftsman with over half-a-century of experience. The Dark Brown Metallic and Dark Gray Matt combination is said to be “muscular and confident;” Light Gray Matt and Silver Gray is “sophisticated and urban;” and the Dark Blue Metallic and White Solid reflects “a yacht on the ocean.” Hand-stitched Nubuck leather seats and intricately-crafted floor mats are highlights of the custom-made interior. “We believe that desire is powered by exquisite design, so every element of our G90 Special Edition has been fastidiously executed by our design team and engineers,' Manfred Fitzgerald, Head of Genesis said. “This approach, combined with influences from our distinctive Korean heritage, ensures that Genesis vehicles stand out confidently in the luxury car sector.” At the Vanity Fair Oscar Party last month, the G90 Special Edition was used to chauffeur guests to and from the VIP event. The carmaker claims the response was so positive, it’s considering putting it into mainstream production.